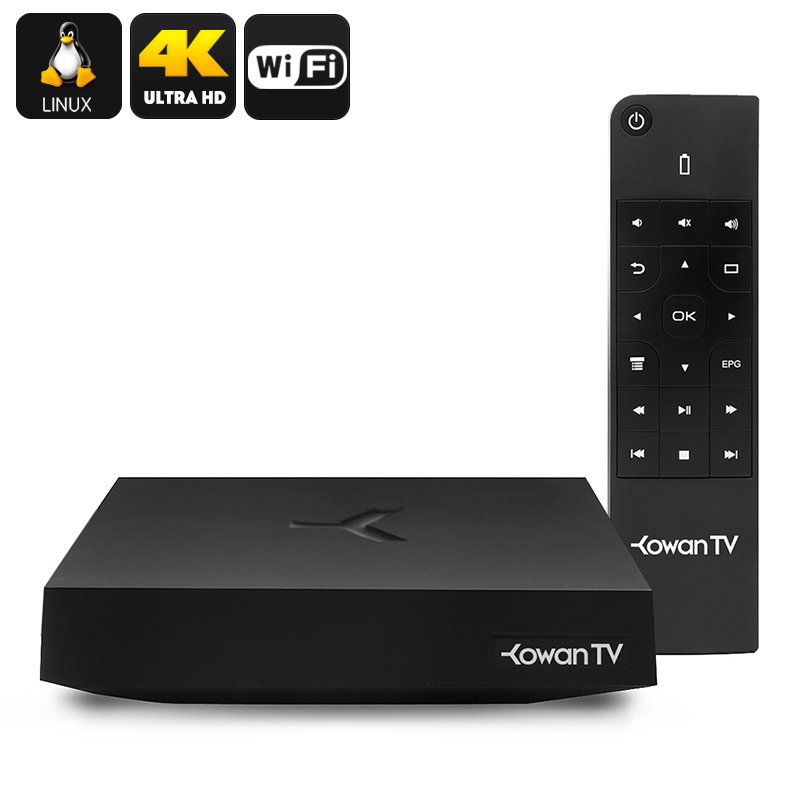 Successfully Added Kowan TV Box - Linux OS, Quad-Core Processor, 2GB RAM, Mali-450 GPU, WI-FI to your Shopping Cart. Turn your living room into an entertainment ecosystem with this powerful Kowan TV box. With its powerful quad-core processor, 2GB of RAM and Mali-450 GPU this Kowan TV box is a real powerhouse that can handle what ever you throw at it. This Linux OS TV entertainment hub offers thousands of free channels from around the world for you to enjoy right from your living room’s sofa on your big screen TV. No longer do you have to wait for regular TV channels broadcasting your favorite shows - from now on you are in control of what you’ll be watching. Besides the numerous of free to access international channels the Kowan TV box also offers a wide range of on-demand channels. With access to popular channels such as TED Talks, Red Bull TV, MTV, NBA, and plenty more you never have to be afraid of missing your favorite show or game again. To all you sport fanatics, TV buffs, music lovers, and TV addicts this device can deliver an entertainment experience like no other. This Kowan TV Box furthermore has been equipped with ultra fast Wi-Fi connection and a Linux Operating System, allowing you to download the latest TV apps and stay connected with your friends through Facebook, Twitter, or E-mail. Streaming video’s straight from the web by using popular platforms such as YouTube is also no problem for this powerful device. Additionally its Wi-Fi connection allows you to connect your Kowan TV box with your other mobile devices such as your Smartphone, tablet, or laptop to share content among one another fast and easily – turning this amazing entertainment station into a mini-pc rather than merely a standard TV box. Its optical audio cable that uses laser light to transmit digital audio signals ensures that no noise from other nearby electronic devices intervenes with the quality of your sound output, guaranteeing a crystal clear audio quality and an exceptional in-home entertainment experience when using this Kowan TV box. This small yet powerful device has been beautifully put together, both from the inside with its powerful processor, internal RAM, and amazing GPU, as well as from the outside with its sleek no-nonsense design. For all of you who are looking for an affordable TV box that can take your entertainment experience to the next level – this Kowan TV Box is the perfect entertainment device.